Kingdom Hearts III is a project that has been 12 years in the making, including almost five years worth of project development. Finally, series director Tetsuya Nomura has given new details that fans have been waiting for. At the D23 Expo, Nomura released a new trailer for Kingdom Hearts III, while also giving an exact year release date for the game. 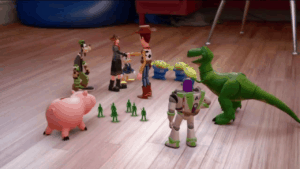 The trailer features the brand new world of Toy Story, while also revealing that the game’s release will be in 2018. This is a huge reveal. The last released full game in the series was Kingdom Hearts II in 2005. Since then, numerous smaller games such as Kingdom Hearts: Birth by Sleep and Kingdom Hearts: Dream Drop Distance were released. First came still images of the worlds of Hercules and Tangled, as well as a concept shot of Big Hero 6. Then, a teaser trailer at E3 2013 to reveal the project’s development followed. Four years later at E3 2017, a real look into KH III arrived. This gave sneak peeks of new gameplay and a hint at the actual storyline for the game. Now, just a few months later, the news and a new trailer for the game. Fans are expectedly crazy and hyped at this new information. They’re roaring anew with excitement. This is nothing compared to the excitement that Kingdom Hearts fans have felt since the initial third installment press release back in 2013. The addition of the Toy Story world is a great feature to the game. This is good timing, as Toy Story recently had their own big release at D23. The movie franchise released information on it’s fourth installment. While rumors circulated that a Pixar world would be added, many fans feared and wondered which could it be. Toy Story is a huge series in the Pixar world, and the fact that KH will be adding the world is an amazing feat in of itself. 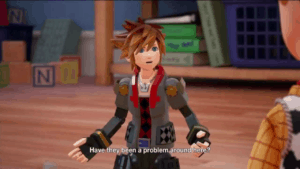 The trailer revealed the designs of Sora, Goofy, and Donald as action figure toys. Also gameplay that features taking control of mech-like toys to battle heartless. If that wasn’t enough, fans got to see the designs of Woody and Buzz Lightyear in their full glory. The trailer revealing a projected release year has fans jumping out of their seats. KH fans are no strangers to waiting, patience is almost second nature to them. Now that there is a confirmed release date by both the trailer and Nomura, fans are more than willing to wait. KH III will act as the end of Sora’s story and complete the Dark Seekers Trilogy, as supported by Tetsuya Nomura. Many plots and holes will wrap up in this third installment. Hints of that are in the E3 2017 trailer showing Organization XIII’s leader Xemnas asking Sora if he wishes to bring Roxas back. Reported in an IGN interview with Nomura, there is also confirmation on two important aspects of the game. A secondary playable character will be introduced. This means that fans will not only play as Sora, but as another character as well. Introducing secondary characters isn’t a strange thing in the series. KH II included Roxas as a playable character for the game’s tutorial. Birth by Sleep even featured three characters, while Dream Drop Distance featured both Sora and Riku. The other confirmation Nomura made is the party system. D-Links seen in Birth by Sleep will not be present. Also, choosing party members will no longer be a thing in KH III. Nomura confirmed that up to five members can be in a party. 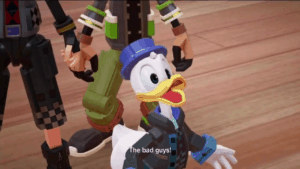 This means players can add characters to their party and fully enjoy having iconic characters without having to sacrifice important characters like Donald and Goofy. Square Enix released Kingdom Hearts 1.5 & 2.5 HD Remixes this past year for the PS4. This in addition to Kingdom Hearts 2.8 Final Chapter Prologue. These games not only offer hints to KH3, but allow players to experience the entire series in a cleaned up fashion. The remastered editions contain games from the entire series, as well as feature length films.